SEOUL, March 21 (KATAKAMI.COM) — South Korean President Lee Myung-bak said Monday that Japan’s nuclear crisis, albeit caused by a natural disaster that was beyond human control, showed risks posed by the science and technology that was developed for convenience and effectiveness, Yonhap News Agency reported on Monday. He said the tragedy in Japan, which is struggling to contain high-level radiation leaks from nuclear reactors crippled by a powerful earthquake and subsequent tsunami, served as a wake-up call to South Korea. Lee affirmed that his administration will continue making efforts to ensure the safety of the people. He reiterated that South Korea is immune to the radiation released from Japan’s reactors, citing the opinion that the radioactive elements cannot be carried off by the wind to the peninsula. “Please do not be swayed by unfounded rumors or unscientific speculations about a nuclear fallout,” Lee said. He also said South Korea has little chance of suffering a Japanese-style nuclear crisis, as all of its 21 nuclear reactors were constructed with consideration of the biggest possible earthquake that could occur here. But the government has already started a comprehensive safety check on all of the plants, he added. Lee said South Koreans can learn many lessons from how the Japanese people and the media have reacted to the ongoing tragedy. 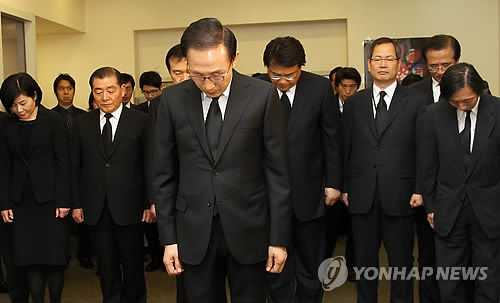 Lee also said he was very proud of a wave of condolences and donations by South Koreans for the neighbor in trouble. ABU DHABI, March 12 (KATAKAMI.COM) — South Korean President Lee Myung-bak arrived Saturday in the United Arab Emirates (UAE) for a four-day visit that would focus on economic talks and expanding cooperation with the oil-rich country, officials said. 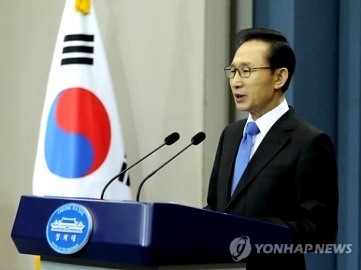 South Korean President Lee Myung-Bak (pictured) has left for the United Arab Emirates, the presidential Blue House said, as part of Seoul's diplomatic drive to expand economic ties with the Middle East. 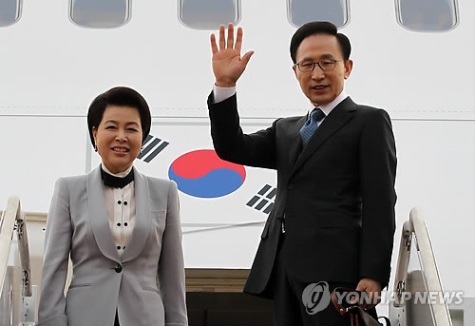 March 12, 2011 (KATAKAMI.COM)— South Korean President Lee Myung-Bak has left for the United Arab Emirates, the presidential Blue House said, as part of Seoul’s diplomatic drive to expand economic ties with the Middle East. As reported by France 24 on Saturday, President Lee and President Sheikh Khalifa bin Zayed al-Nahayan will have a summit on Sunday to discuss economic cooperation, especially in energy, construction, environment and health care sectors. “The Middle East region is important in our development. The United Arab Emirates is significant as a bridgehead,” a senior official at the Blue House was quoted as saying by Yonhap news agency. After arriving Abu Dhabi, Lee will head to the eastern town of Al Ain, where he will meet with some 130 South Korean troops, Yonhap said. Seoul sent the special forces unit there in January for a two-year mission to help train the Middle East country’s commando units and conduct joint drills. The troops’ dispatch came after South Korea won a 20.4-billion-dollar contract from Abu Dhabi in 2009 to construct nuclear reactors in the country. Lee will also attend the ground-breaking ceremony for a nuclear power plant in Braka, some 300 kilometres (190 miles) west of Abu Dhabi, which will be developed with South Korean technology, Yonhap said. During the four-day visit, Lee, accompanied by his wife Kim Yoon-Ok, will travel to Dubai on Monday to meet South Korean residents and receive the Zayed International Prize for the Environment. 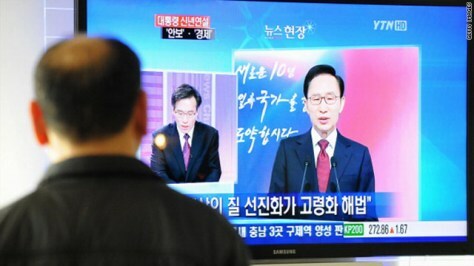 A man watches a broadcast of South Korean President Lee Myung-Bak's New Year policy address in Seoul on Monday. 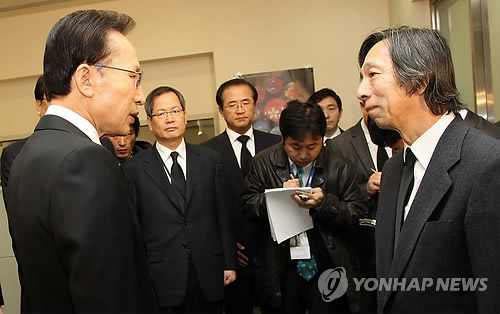 January 3, 2011 (KATAKAMI / CNN) — South Korea’s president said Monday the country should respond to the attack on Yeonpyeong Island the same way the United States reacted to the September 11, 2001, attacks in New York — by using the event as an opportunity to reflect on security and overhaul the country’s defenses. Tensions have been running high between North and South Korea ever since the sinking of the South Korean warship Cheonan last March, killing 46 sailors. South Korea and the international community blamed the North for the sinking, but Pyongyang has denied the accusations. Last month, North Korea said the South’s navy fired into Northern waters and, in retaliation, it shelled Yeonpyeong Island, killing four South Koreans. “We cannot let North Korea covet even an inch of our territory. Any provocation that would pose a threat to our lives and property will not be tolerated,” said Lee. Over the weekend, officials in North Korea called for better ties with South Korea, according to South Korea’s Yonhap News Agency. North Korea urged dialogue and cooperation in 2011 and asked the South to end its military exercises. South Korea’s president said in his televised address that North Korea needs to work toward peace with deeds as well as with words. “I remind the North that the path toward peace is yet open. The door for dialogue is still open. If the North exhibits sincerity, we have both the will and the plan to drastically enhance economic cooperation together with the international community,” he said. SEOUL, Jan. 3 (KATAKAMI / Yonhap) — South Korean President Lee Myung-bak said Monday that the door for inter-Korean dialogue remains open but North Korea should first show its seriousness about the talks. 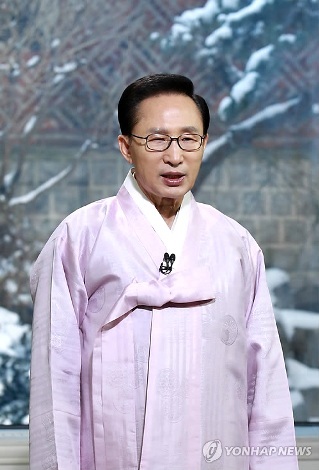 SEOUL, Jan. 1 (KATAKAMI / Yonhap) — President Lee Myung-bak expressed confidence Saturday that South Korea will bring peace to the peninsula and attain further economic development in the new year. He said the country’s fortunes are on an upswing in the international community. He pointed out that South Korea achieved 5-percent economic growth, the highest among OECD member countries, in 2010 and became the world’s seventh largest exporting nation. South Korea also successfully hosted the G-20 economic summit and forged free trade agreements with the European Union and the United States, he said. 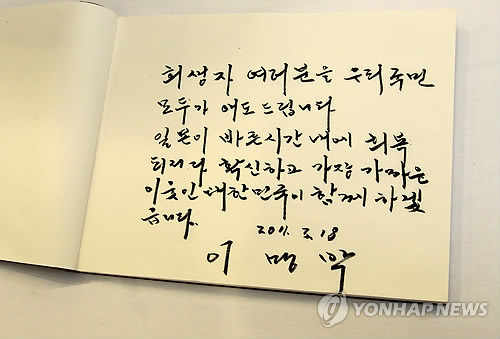 The president said those achievements can be ascribed to the painstaking efforts by all Korean people.